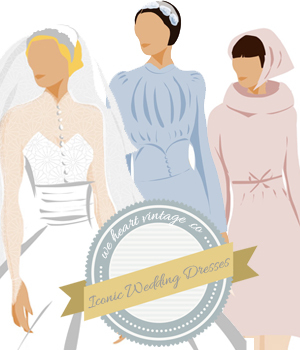 This week’s competition prize has been donated by Virtual Vintage, who specialise in authentic vintage clothing and accessories for men and women from the 1950s-1980s, as well as authentic vintage homeware from the 1920s to the 1980s. 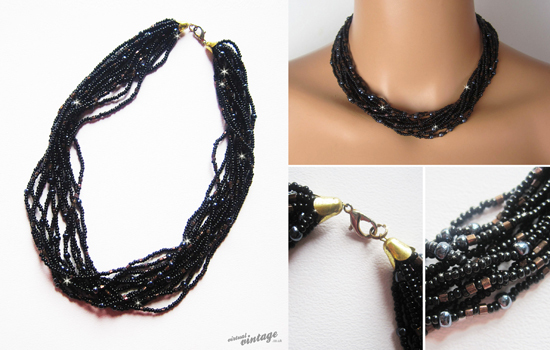 They are offering this beautiful 1950s multi strand glass necklace, which being black will go with pretty much every outfit! A 1950s multi strand glass beaded necklace in classic black with bronze and gunmetal grey beading intertwined with lobster claw fastening. For your chance to win this beautiful vintage necklace simply tell us your favourite item from Virtual Vintage and let us know in the comment box below. For another chance to enter, you can like the Virtual Vintage facebook page and post your answer there too! We’ll pick a winner after entries close on Thursday 10th May. The winner will be announced on this blog soon afterwards so don’t forget to check back or subscribe! We will contact the winner shortly afterwards and pass their details onto Virtual Vintage who will send out the prize directly. 1950s BABY PINK GLASS BEADED NECKLACE HAS GOT TO BE MY FAVOURITE! It would never suit me but I love the 1960s YELLOW FLORAL MINI SHIFT DRESS. It’s gorgeous! I love the 1960s BRIGHT RED SQUARE MOD ERA SHOULDER BAG. My favorite item is the UNUSED 1960s MOD DARK BROWN FAUX LEATHER SHOULDER BAG. I am a fan of Virtual Vintage Clothing on Facebook and have posted my favourite item on their wall! My fave item is the 1960s Navy Blue fitted wiggle shift dress – it’s gorgeous! I oculd not see anything in the men’s section that I really liked but would glady consider the 1970s LONG GREY SUEDE BELTED COAT – SHEEPSKIN COLLAR & CUFFS as a present for someone special. I love the 1950s LUCITE STARFISH PENDANT NECKLACE, it reminds me of a key ring I had as a child. 1980s MAGENTA PINK LONG BATWING JUMPER WITH SEQUINS BY CINZANO is my favourite item. Its got to be the beautiful 1970s black leather trench coat with shearling fur collar. I am in love with the 1940s BLUE LEATHER BOUND VANITY TRAVEL SET… so pretty! I love the photograph of Brigette Bardot! 1940s/1950s MIRROR & BRUSH DRESSING TABLE SET as it reminds me of my grandmothers which I loved as a kid. 1960s TAN BROWN FAUX LEATHER MOD SHOULDER/HAND BAG – Looks like they’re all gone though – boo hoo!! So many fab things but love the 1920s ART DECO OLIVE GREEN TEXTURED HANDBAG – so stylish. 1970s BROWN DITSY FLORAL PRINT KNEE LENGTH SKIRT, lovely pattern! 1960s brown lucite choker necklace – it is very striking. I’m loving the MEN’S 1960s BROWN SUEDE LACE UP OXFORD SHOES – SIZE 9 £49. I THINK LAUREN HUTTON LOOKS ABSOLUTELY STUNNING IN THE WHITE DRESS IN THE 1975 PHOTOGRAPH. THOUGHT THE 70s WERE A BIT OF A LOST DECADE TO FASHION UNTIL I SAW THAT. GORGEOUS! My favourite is the 1950s black lace cocktail dress! It’s beautiful! my favourite are the 1970s Grey Suede Peep Toe Slingback Platform Heels – I want them on my feet!!! This is my first visit to this site and I love it! I loved the 1980’s Black Jewelled Snakeskin Large Shoulder Bag for £18 so much that I bought it! Love this place. My favorite is the 1970s sleeveless bold floral maxi dress. i like the UNUSED 1960s MOD DARK BROWN FAUX LEATHER SHOULDER BAG its really a rar item! The Leopard Print Renetti Stiletto Heels, gorgeous! Thanks for the giveaway. I am a great fan of 1950’s LUCITE STARFISH PENDANT NECLACE because OLD IS GOLD. Got to love these black heeled boots – if only they were in a bigger size…. I love the Diorella perfume by Christian Dior. It has variety,it has spice to rejoice with Vintage Glory All the way.. Mesmerising experience to cherished in your heart. I really love 1950s LUCITE STARFISH PENDANT NECKLACE. I am in love with the 1960’s floral tapestry purse! I like the bright red mod era shoulder bag. The necklace in this comp is my fav!! The 1970s Petrol Blue Halter Neck Maxi Dress By PIPPA DEE looks amazing, i guess my Girlfriend will Love it…and the after effects will be really enjoyed by the boyfriend…ie ME. It will go with some of my lovely dresses…. I love this 1960s FLORAL TAPESTRY/ NEEDLEPOINT PURSE/ MAKE-UP BAG so rare I think.. I found the ‘1970s Brown Sheepskin Shearling Coat’ to be one of the fantastic one with elegant colour and design perfect for a lady. I just loved the look. Wow…I just love the 1950’s SPARKLY CRYSTAL TIERED NECKLACE…It is amazing….If I wear it,all my friends will turn green with envy!!!!!!! I love its pattern & the fabric material,& the colour is the best in every season.It would be extremely skin soothing & yet flaunts oodles of style.I just love it.Joined on Facebook & sharing my favourite dress too with my friends. I love this 1960s GOLD AND BLACK BEADED TIERED NECKLACE, Its amazing …. 1950s BABY PINK GLASS BEADED NECKLACE – its really beautifull and will go well with sari. I love the yellow and orange beanie bobble hat! I like the 1970’s Colour Block Boho Drawstring Pouch Bag. 1960s GOLD AND BLACK BEADED TIERED NECKLACE is my favourite – Looks fabulous! I love the 1950’s baby pink glass bead necklace! 1970s TURQUOISE FLORAL PRINT MIDI TENT DRESS – so pretty! I love the Flower Cloche Hat by Bill Blass of the 1970’s. Lurveeeee the ‘1970’s black & multi floral maxi dress’, so eye catching! I love the 1950’s Red & White Polka Dot Rockabilly dress! I love the Men’s 1960’s Brown suede lace up Oxford shoes. Thank you for the beautiful giveaway and for opening it internationally! There are so many fabolous things on your website! I love the dresses, in particular the 1960s camel brown mini dress with pointed collar and 1970s ‘Pippa Dee’ long blue maxi dress. I loved the 1960s BIBA BY BARBARA HULANICKI BLUE CORDUROY JACKET, would go with so much i own, fab boho style and lovely colour! I love the 1960s LILAC PASTEL PLEATED KNEE LENGTH SHIFT DRESS!! 1970s black flight shoulder bag, it’s classy! i love the 1970s FLORAL HALTER NECK STIRLING COOPER SUMMER DRESS. It’s just so sweet an summery. I have a bit of a fetish for coats and absolutely love the 1970s GREY/BROWN SOFT FAUX FUR LONGLINE COAT – I need to own a fur coat! I love 1950s BLACK LACE COCKTAIL DRESS!! My fave is the 1950s SPARKLY CRYSTAL TIERED NECKLACE!!!!!!!! I like the 1980s UNISEX NEON YELLOW & ORANGE BOBBLE BEANIE HAT! I like the 1960s BROWN LUCITE CHOKER NECKLACE. Really lovely colours. i LOVE THE VINTAGE 1950S NECKLACE!! I’ve always wanted to have the 1950s necklace. I adore the 1950s Sparkly Crystal Tiered Necklace! 1970s GREY WOOL COAT WITH POINTED COLLAR this one looks very nice! !